Postal employees after the construction of the new Downtown Orlando Post Office building, located at 51 East Jefferson Street, circa 1941. 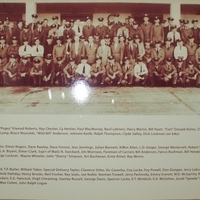 The photograph includes 109 employees ranging from superintendent to clerk. The Postmaster and Assistant Postmaster are included in the middle row of the photo. The group is comprised of mostly white men; however, the second row shows a woman, and the first and third rows show three African-American men. The building was constructed in a Spanish Colonial Revival style from 1939 to 1941 and dedicated on April 14, 1941. It has been occupied by the United States Postal Service since 1941, the Federal District Courthouse from 1941 to circa 1974, and the office of the Roman Catholic Church since 2003. The building was renovated in the early 2000s and was modified for office and retail use, with the post office retaining 13,200 square feet. Plans included an adjacent parking garage on the north side, though that that aspect never came to fruition. St. James Roman Catholic Cathedral, located across Court Street from the post office, purchased the parts of the building not utilized by the post office and use it for Chancery office space. “Employees at New Downtown Orlando Post Office Building.” RICHES of Central Florida accessed April 18, 2019, https://richesmi.cah.ucf.edu/omeka/items/show/5589.